The final riser was grouted on Saturday, October 8! Stop by 27th and Josephine on the South Side to check out this awesome community project! Thanks to artist, Laura Jean McLaughlin, for guiding this project from start to finish, and the hundreds of community member volunteer hours that made this a reality! 73 risers complete (95%) and just 4 in progress! We are collecting the remaining risers for installation! Hope to see you at StepTrek for the unveiling of the project! 56 risers complete (73%), 21 in progress, and 0 to start! Just one more workshop! If you have a riser at home, please bring it to the final workshop, or contact us to arrange for us to get it. We need all risers returned by September 15, 2016 at the latest in order to install them on schedule. 38 risers complete (50%! ), 28 in progress, and only 11 to start! 19 risers complete, 20 in progress, and 38 to go! 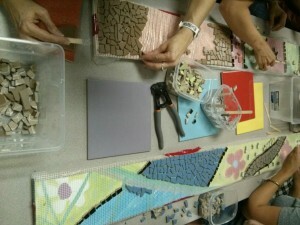 Our first workshop was a great success, and we now have 30 trained mosaic artists and 12 risers started. We have 65 more, so please consider helping us at one of the following events! Both are 6:30 to 8:30PM at the Brashear Association [2005 Sarah Street, 15203] on the South Side. Please help share and spread the word! And hope to see everybody at one or both workshops because we have 77 risers to create! Thanks to all our supporters for your patience. 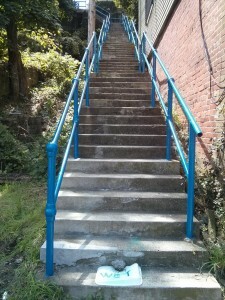 This summer, the South Side Slopes Neighborhood Association is working with the City of Pittsburgh Department of Public Works to repair the Oakley Way Steps using a grant from Allegheny County’s Community Infrastructure and Tourism Fund (CITF). Concurrently, we will be organizing artist-led community workshops in July to hand out supplies and teach neighbors to create the 77 mosaic step risers. Installation is tentatively planned for September. 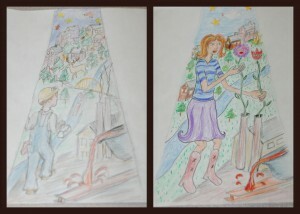 Artist, Laura Jean McLaughlin will be attending the July picnic with further details. Stay tuned on our Facebook page and e-blast as we announce the dates for the workshops. The tile has been ordered, and we are continuing to work with the city to repair the Oakley Way Steps. 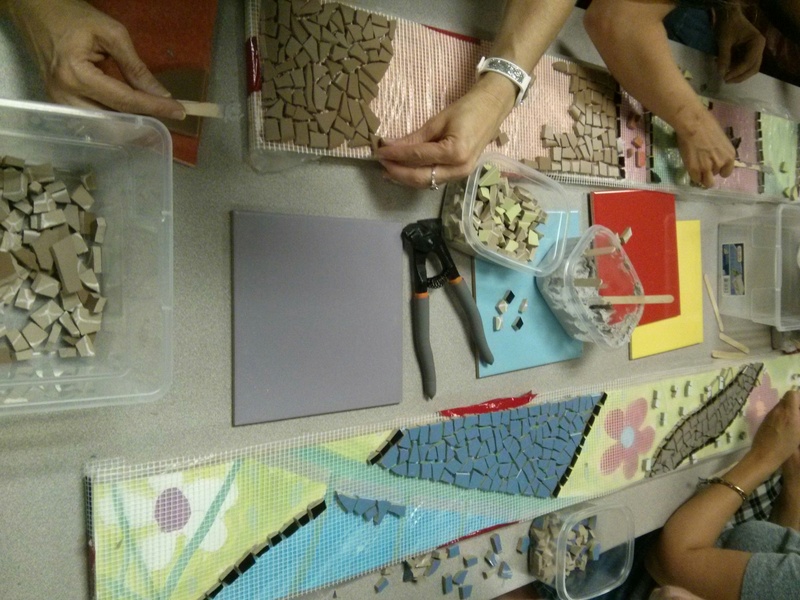 Stay tuned for more updates on public hands-on sessions to start creating the mosaic risers! The project has been approved by the City of Pittsburgh Art Commission! Thanks to everyone who came out to the Acacia Fundraiser! We are working with the city to repair the Oakley Street Steps and are going ahead with conceptual approval from Art Commission. We hope to order the tile soon! 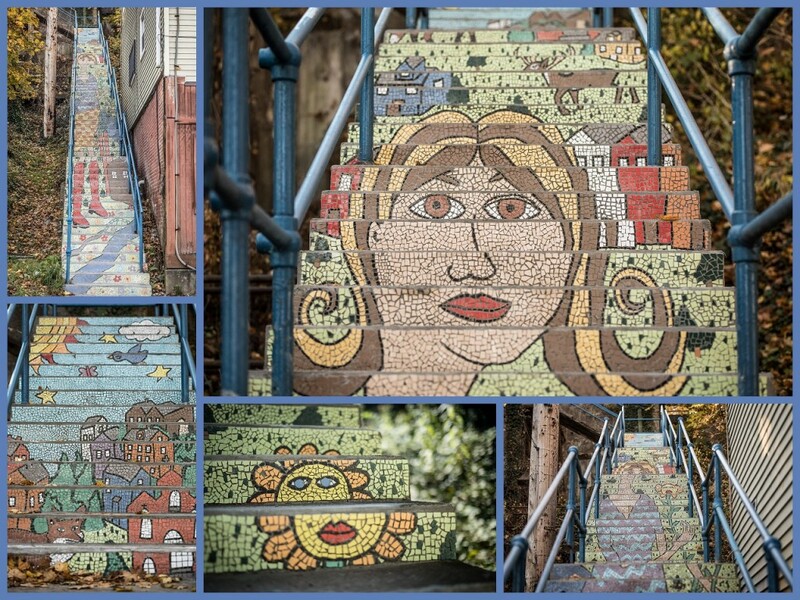 The Oakley Street Mosaic Steps project is a neighbor-driven public art project in the South Side Slopes neighborhood of Pittsburgh. 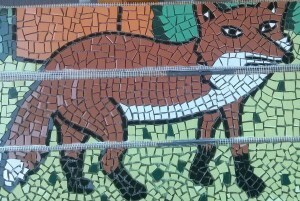 The goal is to create a mosaic tile picture applied to the risers of the steps that can be seen as a piece of art when standing at the bottom of the set of steps. We were inspired by the public murals around Pittsburgh, the many set of public steps in the South Side Slopes, and step art around the world. In particular, the San Francisco 16th Ave Tiled Steps project is a huge inspiration. We chose Oakley Street because it is a very visible, highly trafficked set of steps with solid risers. Neighbors and visitors regularly drive, bike, and walk by this set of stairs. You can see this set of stairs at the intersection of Josephine and 27th Streets. In 2013, the South Side Slopes Neighborhood Association painted the railings a vibrant blue. Laura Jean McLaughlin is a Pittsburgh resident who has created many outdoor tile mosaic projects throughout Allegheny County. She is excited to work with the South Side Slopes residents to create something special in our neighborhood. 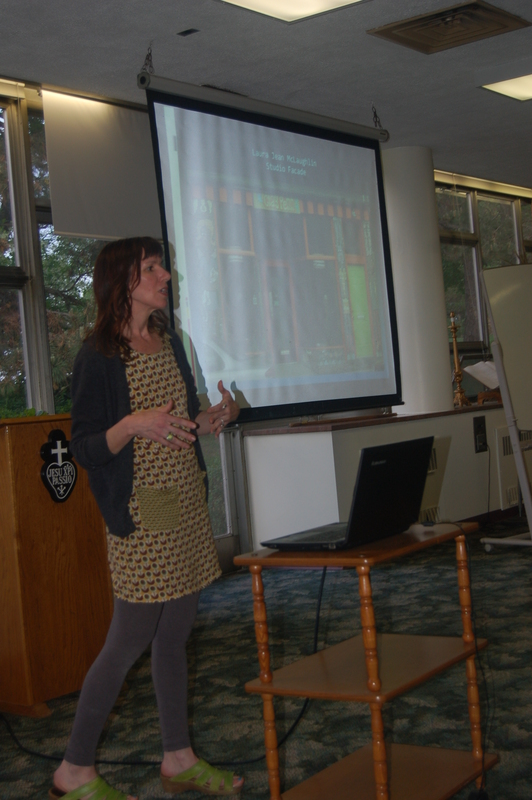 Laura will be holding a series of brainstorming sessions with the community in Spring 2015 to come up with a community-led design. After she finalizes the design, she will be training neighbors to create the mosaic tiles on mesh backings. Finally, the tiles will be attached to the steps and grouted. We invite you to come to one or both sessions to participate in this exciting process. We welcome all South Side Slopes and Flats residents and anyone who is passionate about steps or public art. All ages are welcome. Stay tuned to our e-blasts, Facebook page, and this website to see updates about our progress. We hope you can participate in the design and/or implementation process for this exciting public art project. Will this tile survive the Pittsburgh winters? Yes! 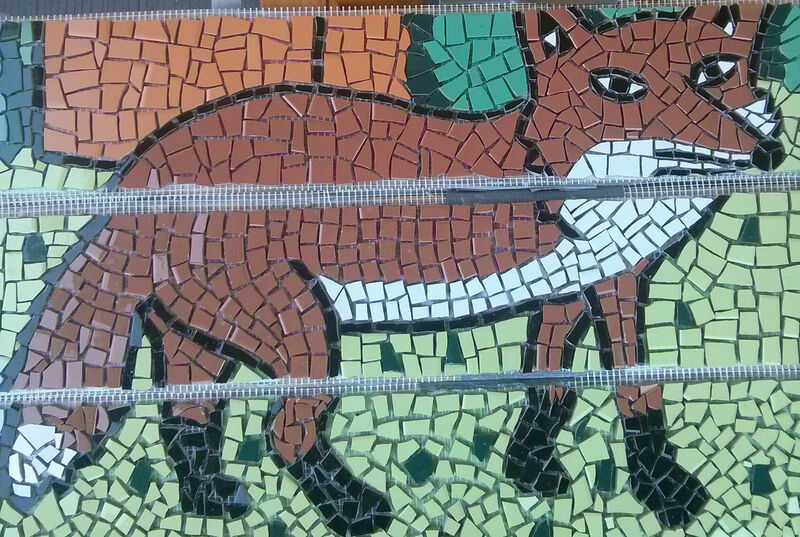 The artist Laura Jean McLaughlin has done many outdoor mosaic projects throughout the Pittsburgh region. She uses a high-fire tile from Italy along with industrial strength adhesive and grout to ensure that the project will look beautiful for years. Won’t the tiles be slippery? We are tiling the risers of the steps – not the walking surface. I was very excited to read about this! I’m a fan of the 16th Ave. tiled steps in SF and when I first saw them I thought it would be great to have a project like this in the Slopes. (I live in CA but have strong connections to Pittsburgh and the Slopes.) I have lots of pictures of the SF steps and, if you could use any of them for an example or inspiration or whatever, I’d be happy to send some to you. I look forward to watching the progress on this project. Thanks.